Heat oven to 350°F. Lightly grease 8-inch square (2-quart) baking dish. In 10-inch nonstick skillet, heat oil over medium heat. Add onion; cook 4 to 6 minutes, stirring occasionally, until onion is tender. Add garlic; cook about 1 minute or until garlic is fragrant. Stir in chicken, taco seasoning mix, water, tomatoes and green chilies until well coated. Heat to simmering; cook uncovered 4 to 5 minutes, stirring frequently, until chicken is heated through. Bake 20 to 25 minutes or until bubbly around edges and cheese is melted. Top with green onions; serve with chips. Leftover dip makes a great filling for tacos, enchiladas or over rice. 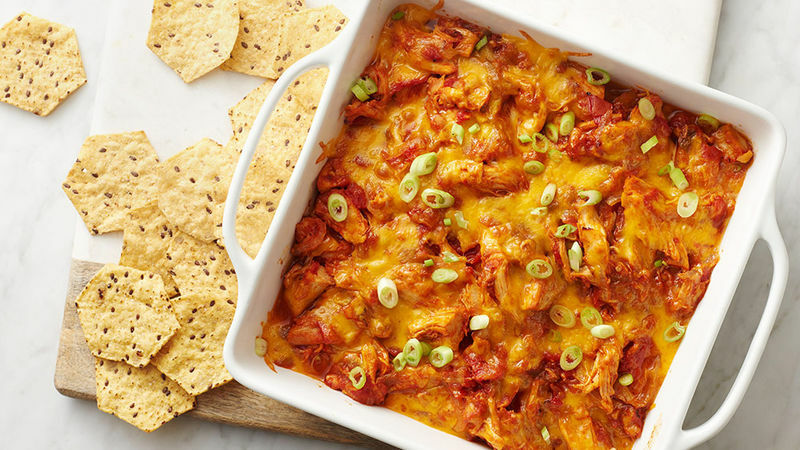 Get all the flavour of slow-cooked chicken tinga in this simple recipe using rotisserie chicken and fire roasted tomatoes.